Home / Blog / Leave a Legacy / How Did We Start Planting Olive Trees in the King’s Valley? How Did We Start Planting Olive Trees in the King’s Valley? With the number of olive trees we currently have growing in the Holy Land, it is hard to believe that it was not many years ago that the idea for our mission had not even been formed. Today we are making a continued push to grow olive trees and grapevines to reclaim the desert, and it all began a little over 10 years ago. In 2004, Curt Landry met with future Prime Minister of Israel, Benjamin Netanyahu, who was then serving as the nation’s Finance Minister. The two were discussing a major humanitarian aid project that had brought more than $20 million into the nation in aid. Mr. Netanyahu was extremely grateful, but also determined that Israel would not become a nation dependent on the aid of others. Several years later, the concept of My Olive Tree was presented to Curt during a meeting in Israel. Initially, it seemed unfeasible. Planting millions of trees with the goal of helping Israel maintain economic independence? But with the help of God, the citizens of Israel, and gracious donors from all over the world, My Olive Tree was birthed and has continued to grow rapidly to this very day. Initially, we began planting trees in the Galilee area. After a few years, we had the chance to expand into the Negev Desert. Thousands of sponsors have helped us continue to grow our reach. So far, we have planted more than 20,000 olive trees throughout Israel. This is still far from the goal of one million, but a number of trees we plant continues to grow each year. The more trees we plant, the more opportunities there are for Israeli citizens to have sustainable employment. 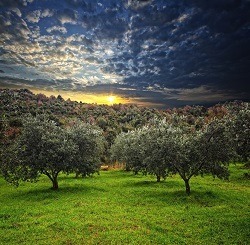 These jobs include not only planting the trees, but also maintaining them, harvesting the olives, and making the olives into a variety of products, including our extra virgin olive oil. All of this money goes right back into Israel’s economy. So while we have a long way to go to reach our ultimate goal, we continue to build momentum thanks to the support of people like you. For more information about how you can sponsor our King’s Valley project, contact us today at My Olive Tree.